In the world of DoD Information Assurance (IA) Online Training, there are many options available. DISA provides four IA online training programs that you must be aware about. On the Information Assurance Support Environment (IASE) page, DISA has an online training catalog which as many IA online training programs. Areas include Cybersecurity Awareness Training, Cybersecurity Technical Training, Cyber Law Awareness, and Cybersecurity Training for IT managers. The below are four DoD IA Online Training resources that you should check out! This is one IA online training that everyone knows about. 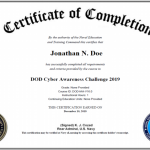 This is part of your annual information awareness training, or your DoD Cyber Awareness training. In short, this is the IA training that we all know about. The latest version is 2.0, which was released in October of 2013. Expect a newer version out sometime this year! The next course is the DoD Authorizing Official (AO) course. Many of you may remember the term Designated Accrediting Authority (DAA). Back in February of 2012, this term was changed to Authorizing Official (AO), per the CJCSI 8410.12. This training will be for any senior official that is in an AO billet. The AO’s responsibility is ensure security requirements are integrated in the acquisition process and life cycle of ISs. This goal must be attained while satisfying the intended design or architecture, complying with selected security controls and safeguards, and managing security changes throughout the designated IS life cycle. 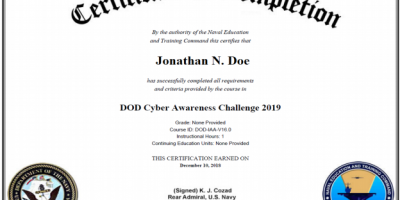 This training will help AO’s perform their duties to the best of their abilities, while also providing up to date information on potential cyber security holes in DoD ISs. identify an individual. This training will assist you in your responsiblity with protecting PII, collecting PII, and what protective measures are needed to safeguard PII.